Okay, maybe I'm an idiot, but this is one of those facts I'd missed until recently. Despite the impression you may have gotten from grade school and/or old Superman cartoons, diamonds are probably not lumps of coal that just got compressed real good—at least, not in exactly the way you might imagine. Diamonds are made out of carbon, but the best evidence suggests that they form far more deeply down in the Earth than coal does. Instead of coal being smushed into diamonds, imagine something more like those "grow crystals out of Borax and water" experiments you did in grade school. Only, in this case, the experiment is performed in the fiery depths of Hell, as very un-coal-like atoms of carbon are compressed and heated deep in the Earth's mantle until they start to bond together and grow into a crystalline structure. Once the crystals are formed, they get to the surface of the Earth via volcanic eruptions. The really interesting thing about all of this is that it's one of those ideas that's very hard to verify. 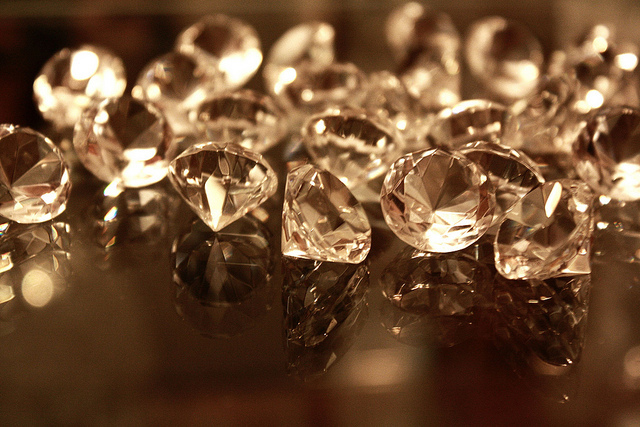 Diamonds form at a depth we can't go observe directly. All we have to work with is indirect evidence. Because of that, nobody knows exactly where the necessary carbon to make diamonds comes from. This is why the "diamonds are coal" story exists. Some scientists think the carbon is stuff that's existed in the Earth since this planet was formed. Others think it might be coming from terrestrial carbon that got shifted down to the lower levels via plate subduction—although, even then, we're talking about carbon, but not necessarily coal. It could be a combination of both. Either way, the mental image of smushed coal doesn't quite work.